I have had a small collection of trees lying in a box for about six or seven years, picked up at a Gamesday event. Back then, one of the attractions was that they ran scenery workshops and you could take home the fruits of your labour. 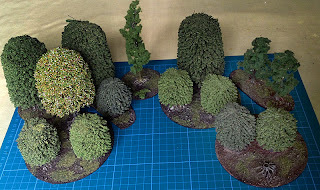 I received a good number of these trees, hot-glued to cork bases and with copious amount of flock added (most of which scattered all over the coach on the trip back). After a few sessions the cork warped and was disposed of, the loose trees were thrown into a box and added to my to-do list. Since I play most of my games at a friend's house, with all scenery provided by him, they have been low priority for a long time. But this week they went up the list and I had a spare day so I got to work. The trees have been hot-glued to bases made from plastic templates. The elongated bases were cut from teardrop templates. Then I added a mix of sand and small stones using pva glue. When these were dry, I used cheap craft paint to quickly dry brush the bases and some of the more visible trunks. Finally I sprinkled on a mix of green and brown flocks. It does look more like finely groomed parkland than a wild forest, but it's fine for two or three hours of effort. 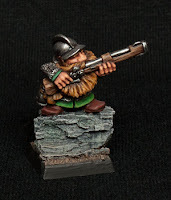 Here's a few dwarfs from my collection. I have dug them out because I am already planning how to paint the new dwarfs heading my way, from the RedBox kickstarter project which ended recently. I thought I would look at my old figures, learn from past experience. The thing that strikes me most about these figures is the flesh tones. For years I used those recommended by GW. They look a bit too orangey for my current tastes. I have used tallarn flesh in the past, but my current method is to start with dheneb stone and glaze in some colours and shadows. I know these colour names have changed now, I will most likely use a coat d'arms equivalent. This is the oldest figure in my collection, he's about 350 years I guess. Once a fine warrior, but now hobbling along with a stick and moaning about his bad back. On his belt, a book detailing all the things that were better in his day. I think I picked this up on ebay, it's certainly older than my entry date into the hobby (the early 1990's). It's not much use for a game, though I could use him in scenarios as a rescue target. 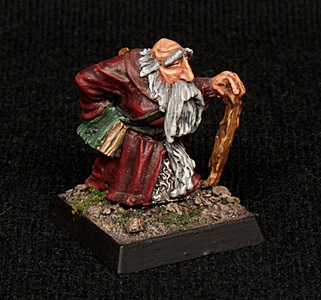 The red robes seemed like a good idea at the time, it must have been near xmas time when he was painted. 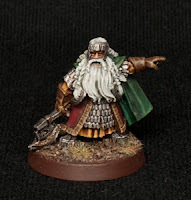 This is the most recent of my figures, Balin the dwarf from the Lord of the Rings range. The scale is much smaller than Warhammer figures and the proportions are more realistic, both on the weapons and facial features, hands, etc. This is the style I most prefer at the current time. 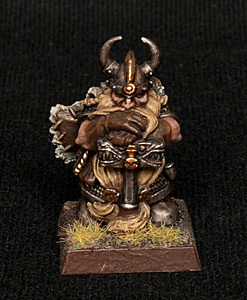 I still like my Warhammer dwarfs, but I think they have been superseded by several ranges in the past few years. 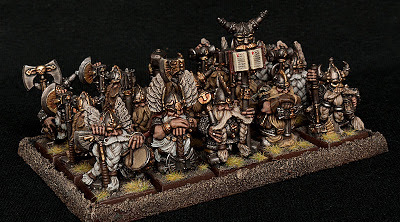 I have a fancy to collect a small band of dwarfs for use in the Lord of the Rings, my favourite skirmish game of the moment. It's either them or their "taller cousins", the Rohirrim. Finally in the old collection lineup is this metal gunner, perched on his cork outcrop to make height comparisons more difficult. Awkward little beggars at times are dwarfs. I can't remember why I painted him up, I think it was a test before I started my plastic army. I decided against the glowing green, this was one of the last figures I painted in classic GW methods, before I discovered the joys of realistic tones and glazing. I know there's a lot of love out there for the old metal dwarfs, which I have never really shared. But I do recognise the charm of figures from this era. 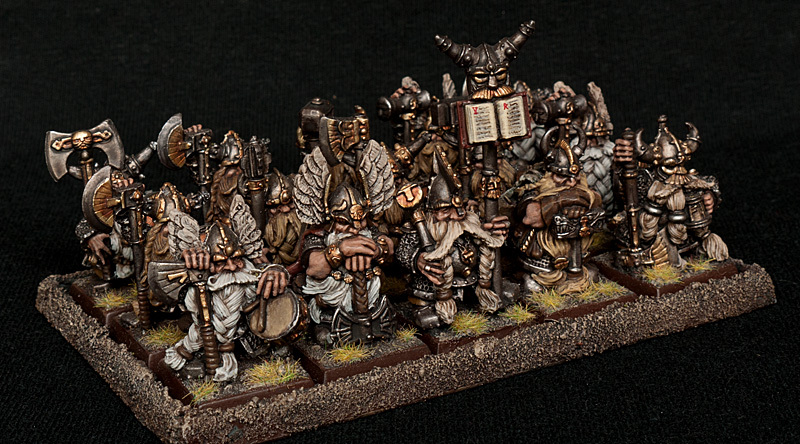 Coming into the more recent past, this is how I painted up my dwarf army. It's less precise and more earthy, I decided long ago that I could paint each model carefully and to a high standard and have a collection of about 20 figures by the time I reached 100 years old, or I could cut a few corners and pump out regiments at a far quicker rate. There's an appeal in both methods, but the regiment technique is the only way that's practical for mass combat systems like Warhammer. More careful and painstaking is fine for skirmish games, or for those devoted enough to spend hundreds or even thousands of hour on their collection. For me, it took me a long time to accept it, but it's okay to say "good enough" for wargaming figures and move on to the next item on Mount Unpainted. Ranked up and with a nice banner, they look decent enough. Unlucky for some, thirteen of Sauron's finest warriors added to the orc army. There are twelve plastics plus a metal captain (centre front) here, all courtesy of ebay. With an extra point of strength and armour, these scum are head and shoulders above the usual Mordor orcs, both in ability and height. To further differentiate them, I have painted a basic eye design on the shields. The Mordor army now comprises three captains, one of which is a Gothmog model, 30 orcs (including a standard bearer) and 12 Morannon orcs, plus a troll. Using the leaders as basic (non-character) models, the army is a shade over 500 points. That's probably the quickest army I have ever collected and painted, just under two months since I started the first unit, though admittedly the troll and Gothmog were painted some years ago. I think this is one reason I enjoy skirmish gaming so much, completion of forces is more achievable than huge armies. There are more Mordor troops in my pile of unpainted figures, including some fast moving wolf riders which are probably the most needed element of the army. I am hoping to blast through them at a similar rapid pace. I can then turn to painting up a good force. 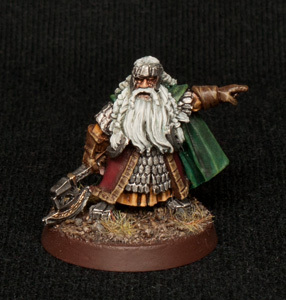 A few years back I painted a dozen Gondor troops and they were really quick to do, but I find them visually tedious. I have some Rohan troops waiting for attention, but also have a fancy to collect some dwarfs. Bearded good guys on the way, for sure! 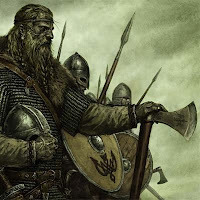 Vikings were the first eco-warriors! The vikings! Blood thirsty warriors of the dark ages, sailing the northern oceans in their dragon-prowed longboats, raiding and pillaging, extorting and robbing - that's how we probably view vikings. That's certainly the picture painted in the media, from the Anglo-Saxon chronicles to Hollywood films. Recent historical evidence has, of course, shown us a different side to the story. They were first rate traders and merchants, using their shipcraft to navigate inland as far as Kiev in Russia, and even discovering the continent of America several hundred years before Columbus. How does that make them eco-warriors? Check out this building, from the viking era. Sustainable timber and green roofing! Yes, I am stretching it a little - what else would they build with? On a recent holiday to Skyrim (aka the Norwegian Folk musuem in Oslo), I was inspired by these buildings. These are far more impressive than the usual wattle and daub stuff we see for Dark age dwellings. I am hoping to recreate this style in tabletop terrain, at a future unspecified date of course. Seeing this has finally convinced me to get started on a second Saga warband. It's early days as yet, I am still looking around for decent figures. In the meantime, here's some more pictures to inform and inspire. Note the raised foundations, to protect from damp and frost. Stone foundations on this example. I don't think I will be able to recreate this level of craftmanship! That's enough photos for the time being, I did take lots more but these give a good flavour of what I hope to achieve. I have a vague idea of using foamboard and coffee stirrers or kebab sticks, or I might just buy some mdf kits from Warbases and take it from there. There are some pretty big Kickstarter projects around at the moment. I have been tempted by a few but managed to resist, mostly because I just don't have the time to keep starting new gaming sytems. For example, last year I spent some time painting up Battle of Five Armies forces, but managed just one game. Similarly, this year, I have painted enough figures for the first scenario of Sedition Wars, but have yet to try it out. So where does the Redbox Games kickstarter fit in? I have always liked the figures but never been tempted before because they are small in scale (truer to 25mm) and are quite pricey. However, the kickstarter is offering some figures from the existing catalogue at very reasonable rates, along with new sculpts for the existing fan base. The scale appears to be very close to that used in Lord of the Rings, which I am enjoying at the moment. But mostly it's because I really like the dwarf range. 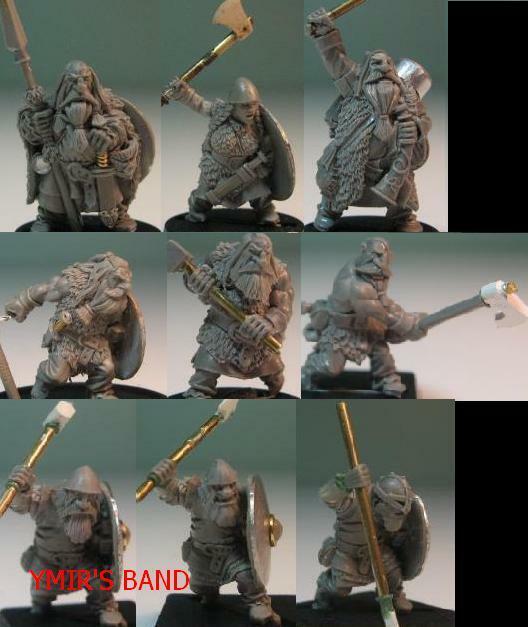 This set and the new modular dwarf warriors are most likely the figures I will choose. They are far less armoured than most dwarfs in the market and offer a slightly different take on the genre. I think they are just superb and hopefully the campaign will live up to the hype and deliver very soon after the end date (my experience with every other crowd funding project is that they are delayed, a month or two if you are lucky, much more in some cases).